Soak in the UNESCO-listed beauty of Austria’s mountainous Salzkammergut region on a private, full-day tour from Vienna. Admire the baroque library at Admont Abbey, stroll through the cobbled village of Hallstatt, and visit lakeside Gmunden, noted for its craft shops and Ort Castle, set on an island. Select a day trip with a driver only to explore each stop independently, or upgrade to a guided trip with a driver-guide. Select your tour option on booking. Choose to travel with a driver only and explore each stop independently, or upgrade for a driver-guide and enjoy private tours of Admont Abbey, Hallstatt, and Gmunden. Then, depart your Vienna hotel by private vehicle and journey eastward into the UNESCO-protected Salzkammergut region in the Austrian Alps, famous its high peaks, pastures, lakes, and traditional villages. Drink in the views on route and if you’ve selected a guided trip, listen as your guide shares facts about this spectacular area. Stop first in the charming town of Admont, and visit Admont Abbey (own expense), a Benedictine monastery on the River Enns. Founded in 1074 and rebuilt in the 19th century after a fire, this baroque gem houses the world’s largest monastic library. Admire the graceful exterior, and head inside to see the 18th-century library, a stunning baroque hall. View the cupola frescoes and wooden sculptures, and take in the 70,000-strong book collection displayed here. Next, continue through beautiful scenery to the old-time salt mining village of Hallstatt. Set on the shores of Lake Hallstatt, this enchanting place features a collection of 16th-century Alpine houses and cobbled streets. Wander around the pretty lanes and buildings, admiring the picturesque mountain and lake views, and soak in the medieval history. From here, travel onward to Gmunden, a pretty town on the banks of the River Traunsee. 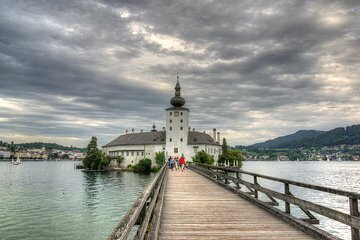 If you wish, take a walk around Ort Castle, the town's picturesque Gothic castle perched on an island on Lake Traunsee. Plus, enjoy time to delve into Gmunden's charming streets, perhaps treating yourself to a late lunch (own expense) or browsing for local ceramics and handicrafts in the markets and shops. Lastly, relax on your return journey to Vienna, where your trip ends with a hotel drop-off.